While the IVPP is the center of paleontology in Beijing, the true fossil treasures of China are housed in the Geological Museum of China(NGMC). Founded in 1916, the museum has collected over 200,000 geological specimens over the last century, many of which have been fossils. By far the most emphasized specimens in their collection are the many Shantungosaurus fossils that they have discovered in Shandong Province. The museum actually had a giant Shantungosaurus model out front for many years, although it seems to have been dismantled(or they just hid it in front of some other side of the museum). 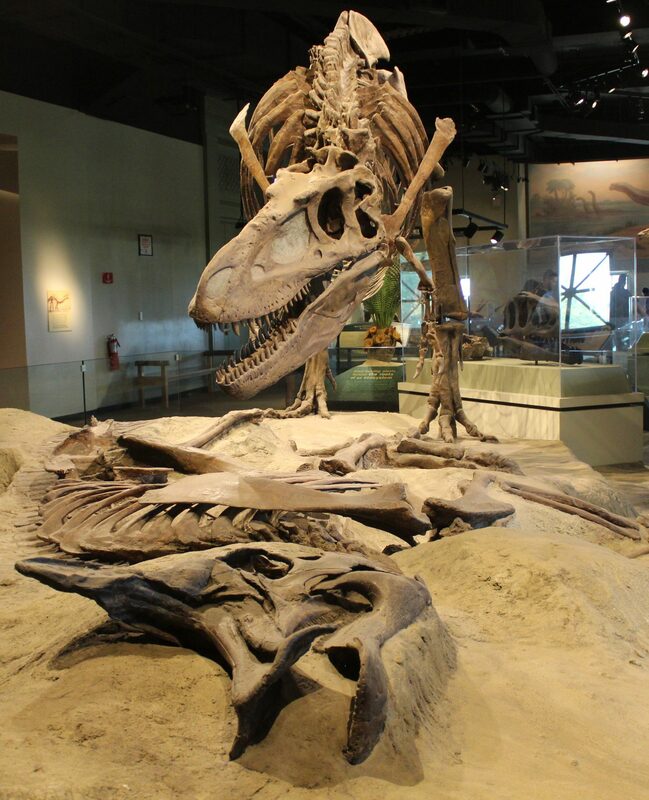 Nevertheless, despite the museum having a giant collection of bones from the largest hadrosaur known to science, fossil mounts are not where the museum’s fossil halls shine. Despite what you may have heard, the museum(disappointingly) does not have a giant composite Shantungosaurus mount because first, there’s literally no space in the museum that could possibly hold a giant mount like that, and second, the museum is pretty hyped-up about displaying just some vertebra of Shantungosaurus, the only material they do have on display. However, this may change, as the museum runs kind of rampant with their special exhibits. Where the NGMC’s fossil halls do stand out, however, are their immensely treasured small dinosaur fossils, such as a certain Sinosauropteryx specimen that was found in 1996. Anyway, as the museum barely has any fossil mounts, the fossil halls are relegated to a relatively small space on the third floor of the museum. Once you take the elevator up(because if you walk the stairs you’ll eventually tire yourself and die), you are abruptly in the presence of a sauropodomorph. Well, this is China, so we already know which sauropodomorph it’s going to be. Oh, you want a fossil mount? Here’s one of our billion Lufengosaurus specimens! Photo by the author. Seriously, if you’re a big museum with a paleontology exhibit, in China, you have to have Lufengosaurus(or you can take a Jingshanosaurus and label it “Lufengosaurus”, if you want). Anyway, the lighting here makes this mount look great, and the low ceiling makes it look bigger than it actually is. Also, the scrunching of the mount into a corner does help make it larger also helps. And I suppose the screaming skull makes it look more dramatic. The mount seems to mostly be made out of reconstructed material, as the reconstructed portions(which are easy to spot, thank you NGMC) make up most of the mount, including the skull. However, parts of the pelvis and legs(and many other parts, I’m sure) look pretty real. The mount is in a quadrupedal posture, which was the common posture that “prosauropods” were portrayed in during the 1990s to early 2000s. This mount does seem to be rather old, as looking at photos of the museum, before the epic lighting, the mount was still in this pose. Now, however, it’s generally accepted that Lufengosaurus and co. adopted a mostly bipedal posture, although this posture was probably not anatomically impossible, but is still unrealistic. Next to the mount is a sign in Chinese only that talks about the dinosaurs of Yunnan, and shows a picture of the Lufeng Dinosaur Museum, epic lighting and all. Now, if you haven’t noticed already, there are a bunch of beautifully painted fossils in the background of this mount. This “mural” wraps around the entire room, and is designed to look almost like a yellow parchment that has fossils laid on it. There does seem to be an abundance of Hyphalosaurus painted on this thing. There are actually no barriers between the visitors and the mount, and the only thing separating the mount from people is a line of potted plants. Next to the Lufengosaurus is something much smaller, but is still one of the museum’s treasures, apparently. Guess what it is? It’s a Shantungosaurus!… Photo by the author. It’s ironic how much the Shantungosaurus fossils at the NGMC are emphasized and publicized, and yet this sacrum is the only display in the entire museum that even mentions Shantungosaurus. However, just being in the presence of these vertebrae, you can tell how massive Shantungosaurus was. It’s claimed that these are all real fossils, however, the shininess of these vertebrae indicate that either these fossils have been painted over with shiny paint, or that they are casts. One interesting thing to note is that, a couple months ago, I inserted this photo into Wikipedia. Right now, as I’m writing this, this sacrum is labeled on Wikipedia as belonging to the ‘Huaxiaosaurus’ specimen, a junior synonym of Shantungosaurus with a similar case to the more familiar ‘Zhuchengosaurus’. Yet I’ve asked many others, and they maintain that this is not ‘Huaxiaosaurus’. Well, it’s all Shantungosaurus in the end anyway. Up above the sacrum, there is a small model of Shantungosaurus displayed, and it is actually fairly accurate. Then again, it is really hard to make an especially inaccurate hadrosaur model. In another diagram nearby, a skeletal of Shantungosaurus is shown, with the displayed vertebrae colored yellow, indicating their status as a sacrum. This is good, as I would assume that a regular visitor would have no idea what these bones are. Now, from the elevator, and going left, the actual entrance of the fossil hall appears. The fossil hall is symbolized by a trilobite, and that’s pretty much the only way you’ll be able to find it on the map of the NGMC if you can’t read Chinese. According to the NGMC’s website, the hall is divided into two parts: the Preface Hall, and the much larger main display space. The Preface Hall is mainly comprised of a giant wall sculpted into the shape of many fossils in rock, or, an “artistic fossilized wall”, as the NGMC calls it. Nearby, the preface hall also introduces the basic concepts of fossilization, and some basic examples of prehistoric animal groups. The second part of the exhibit is divided into eight different sections. Starting from the giant fossil wall, and going left, the second part begins. The entire exhibit from this point is organized very chronologically, and bears a U-shape, similar to Evolving Planet at the Field Museum. The exhibit, in general, is a very dark space, with lights illuminating the fossils against a stark white/grey backdrop. The first two sections all deal with very early life, and of course, the first section, dubbed “The Earliest Life”, features stromatolites. The next of the two sections takes on the topic of the Cambrian Explosion, so it adequately displays a bunch of early invertebrates, such as these trilobites. Small Trilobites, Big Trilobites, Medium Trilobites, Badly Preserved Trilobites. Photo by the author. Now, moving on, I guess. As the display moves on from that huge slab of trilobites, it continues to focus on a variety of early invertebrates, mainly from the Cambrian and Ordovician. One great thing about this first section of the hall is that there’s no pesky glass inserting itself in between the visitor and the fossils. While many people may berate that, in fear of unknowing visitors placing their dirty little hands on the priceless specimens. However, here, and in most of the museum, barriers such as glass are essentially replaced with security guards keeping watch from a distance. While this may sound somewhat constraining, the guards position themselves much out of the line of sight, in a location where they can keep good watch of the visitors, and still be out-of-the-way. So, back to what could possibly be good about taking away glass. For one, this allows great photos, which was delightful for me. Secondly, it removes a very common mental barrier between the visitor and the fossils, and overall upgrades the exhibit quite a bit. However, as you’ll see in a moment, the absence of glass does not last. Meanwhile, here’s some nicely lit invertebrate shells for ya. 2.7/10; Lighting not dramatic enough. Photo by the author. There we go. Photo by the author. Oh, and here’s some nice crinoids on a slab. Lighting is perfection. Photo by the author. Now, moving onto vertebrates. And you know what every museum displays after the invertebrates of the Cambrian-Ordovician? That’s right: fish. Here in the exhibit, the chronological narrative is briefly lost, and it’s just a bunch of fish from different time periods. 0/10; PLAIN LIGHTING!? Photo by the author. Glass case+dramatic lighting= perfection. Photo by the author. Psssh, these aren’t very interesting… Photo by the author. …well, Hupehsuchus is weird enough. Photo by the author. Here, there’s a marvelous specimen of one of the more bizarre Triassic animals, Hupehsuchus, an early relative of the icthyosaurs. This specimen fools most people, because it looks like a weird hodgepodge of different marine reptiles. The head looks like an icthyosaur, and the delicately preserved flippers are like those of a plesiosaur. And then there’s those extraordinarily long vertebrae. After this point, the hall turns to the right. First, there is a large diorama of a Carboniferous diorama, which every single fossil hall in the world seems to have, and it’s not too special. It’s just another Carboniferous diorama. Now, on the other side of the hall from the diorama, there’s something more interesting. How to take a photo of a giant icthyosaur fossil; Choice 1: Crop off the tail. Photos by the author. Here is a giant icthyosaur stretched across the wall, labeled as Cymbospondylus. However, it seems more likely that this is in fact a Guizhouichthyosaurus, which used to be a species of Cymbospondylus, C. asiaticus. The way the exhibit orients the display means that the giant fossil is quite an abrupt surprise. Leading up to this point, you only have fairly small fossils, and then you round a corner, and the giant ichthyosaur is abruptly in your line of sight. This is one of the few places where the dramatic lighting used throughout the exhibit doesn’t actually work. The light only shines down from above the fossil, meaning that bottom portion of the slab is more obscured. With such a large display, in most cases, the museum would install a large sign. However, here, in the NGMC, the signs are exactly the same small size as all the other signs in the exhibit. So, the sign is incredibly diminished by the sheer size of the ichthyosaur. Arguably, this fossil is probably the largest fossil on display in the hall itself. Now, moving on, to the next display of everybody’s favorite extinct reptiles, on the same wall as Guizhouichthyosaurus. I hear headless sauropodomorphs are all the rage these days. Photo by the author. So, on the same wall as mistaken identity Guizhouichthyosaurus, we have another mistaken identity. This sauropodomorph specimen(which is really just four limbs stuck to a series of vertebrae) is labeled as Anchisaurus sinensis. Well, Anchisaurus sinensis was reclassified as a completely new genus, Gyposaurus. The specimen is displayed in a sort of “death pose”, with all the bones laid out. Guizhouichthyosaurus and Gyposaurus are just two of many invalid names the fossil hall uses, as you will soon see. From the two large reptiles, the gallery turns once more. This time, the gallery opens up. That is because the hall now deals with the Mesozoic. But first, a small display space to the left serves as a brief introduction to dinosaurs and all that stuff. Oh, and it has a giant mass of bones as its centerpiece. The museum has an insatiable appetite for spectacle. Photo by the author. In the center of the display space, a large glass pyramid sits on top of a bed of fossils, illuminated along the edges. This display sits in the center, and no signage, and no explanation is provided. It’s simply something cool to gaze at. If this is real, then it is a stunning imitation of a mass fossil graveyard. Besides that articulated ribcage and tail, almost everything else is chaotic and disarticulated. The true extent of the bed is hinted at the slab of rock extending far out from the limited view hole the pyramid provides. Now, that’s basically the only thing out-of-the-ordinary that the display space provides. Moving on. The dinosaur gallery is guarded by a truly beautiful Psittacosaurus display. Pros and Cons of a beautiful, reflective glass case: Pro: It’s beautiful. Con: People’s annoying faces are everywhere in the photo. Photo by the author. This is the quintessential Psittacosaurus skeleton that every museum in China must have. Some times, they’re put in unique poses. Other times, they mount as many Psittacosaurus as possible. And here, they display it in a stunning glass case that serves as a mirror and a display case. The bad thing about that is that the above photo is now horrendous due to my cropping out of some pesty Homo sapiens faces. Now, this specimen is from Beipiao, so it’s obviously P. lujiatunensis. It’s pose is quite dignified, with the case raised to eye height, and the Psittacosaurus holding its head high. If I were to choose the best singular display in the museum, this would be it. Now, moving on to something much more modest. While the display itself is more humble, this is a very large slab of Lycoptera. The red writing on the fossil was written upon the addition of this specimen to the collections of the IVPP. The writing roughly states the donation and acceptance of this specimen to the NGMC. Next, the most common pterosaur in Chinese museums is displayed, in the most common way to display pterosaur fossils. Of course it’s Dsungaripterus, because it’s always Dsungaripterus. It’s also on a plaque mount, but it’s not like this is a common way to display a pterosaur in museums or anything. Oh wait, yes it is. I see no difference. Photo by the author. Not only is the NGMC mount a plaque mount, it also looks exactly like the mounted type specimen of Dsungaripterus in the Paleozoological Museum of China. The PMC’s mount is actually better, as missing bones of the specimen aren’t replaced with identical casts, but with a skeletal diagram. The fingers on the NGMC mount are also quite weird and splayed out. After this, the NGMC transitions to focus on its most prized fossil specimens: the feathered dinosaurs of China. Some random big theropod skull sitting in the back. Photo by the author. However, we gotta display a Tyrannosaurus skull cast first, and that of AMNH 5027, specifically. The purpose of this skull, in this display, is probably just for catering to popularity. It’s in the corner of the display, so for once, a Tyrannosaurus display is not considered a focal display for an exhibit. But people aren’t ignorant of their surroundings, so the first thing they look at in this display is always the Tyrannosaurus skull. Now, this skull seems to serve no use to the display it’s positioned in, so, let’s touch on this display for a bit. The NGMC here mounts a pack of Velociraptor torturing a pair of Oviraptor. Just like almost all Oviraptor mounts, the Oviraptor here seem to just be casts of the famous ambiguous oviraptorid specimen IGN 100/42, which may be Citipati or some other new oviraptorid. However, they actually more closely resemble an undescribed specimen, one of the ‘mitrata’ oviraptorids. The problem with these being one of the ‘mitrata’ oviraptorids is that it doesn’t seem likely that the NGMC got full-blown skeleton casts of these things. Now, putting aside the pronated hands that are everywhere in this display, there is one striking problem with this display: the eggs. The shape of the eggs and the nest shape is completely fine. However, that egg orientation is off. Now, the question is this: the accurate orientation of oviraptorid eggs is known by tons of people, so why did the NGMC screw up here? We’ll probably never know. It could be sheer laziness, or just an overlooked detail. There’s also another, larger, problem with this display: the environment. Ignoring the sloppily put-together background(in which one of those ever-present DK Giganotosaurus reconstructions resides), we see quite a lot of vegetation here. However, the Djadochta Formation, home to Velociraptor and Oviraptor, was a desert. Of course, this can be interpreted as an occasional portion of Djadochta somewhat filled with vegetation, but the NGMC probably should have done a better job of trying to portray Djadochta. And…these are the only mounted dinosaurs in the entire hall. That’s because the true gems of the NGMC are in it’s individual specimens. This entire section of the exhibit is pretty much a rectangular shape, with a mural, mounts, and models bordering two sides of the exhibit. In front of all those displays is a line of illuminated display cases, each with an individual specimen inside. The space in-between these two sides is also filled with larger display cases. Right now, we’ll cover the display cases in front of the model and mount displays, starting from the display case right in front of the Tyrannosaurus cast skull. A cast of a Hyphalosaurus adult preserved with a youngster. Photo by the author. This cast is of yet another specimen of Hyphalosaurus, because Hyphalosaurus is a necessity with any museum with Jehol stuff. This slab actually preserves a baby along with the adult, although the younger is much less noticeable. It would have been more helpful if the signage actually pointed out that there’s a baby in the slab, instead of just the normal tiny name sign that’s next to every single specimen. The fact that this is a cast instead of an original specimen is peculiar, as most museums display original Hyphalosaurus fossils with no problem at all, due to the enormous amount of fossils available. Of course, a fossil with a youngster is much more valuable than a typical Hyphalosaurus specimen, so there’s still reason to display a cast. Next, they display a crushed cast of a Psittacosaurus sp. This specimen most likely comes from the Jianshangou beds of Yixian, since the Lujiatun beds, where most Yixian psittacosaurs come from, preserve more three-dimensional fossils. The fact that this is another cast, instead of the usual original Psittacosaurus specimens that museums display, is somewhat backed up by Psittacosaurus fossils being far less common in Jianshangou than in Lujiatun. The next specimen shown will give anybody with a basic knowledge of Liaoning dinosaur specimens a heart attack at first glance. Hey, look, it’s the original 1996 Sinosauropteryx specimen-oh wait, it’s a cast? I sure wasn’t expecting that! Photo by the author. You must imagine my disappointment upon seeing the tiny little print on the tiny little sign in the corner of this display that indicated this was a replica. Of course it would be a replica, as nobody would actually consider putting this specimen on permanent display. The significance of this Sinosauropteryx(starting the feathered dinosaur revolution, being beautifully preserved, showing colors, etc.) is somewhat conveyed by the much more prominent display case and lighting around it. Of course, it lacks any type of significant signage pointing out the importance of this specimen. This specimen can almost be considered the pinnacle of this entire gallery, as it’s the most accented and emphasized display, and it’s right where the two long display cases along the two sides of the gallery meet. Next, the focus switches, turning from the flattened fossils of Jehol to more typical, three-dimensional fossils. Hey, look, Zhuchengtyr–cough, I mean Tyrannosaurus zhuchengensis. Photo by the author. Instead of just grouping all the teeth together, and giving one label to all of them, why not separate them into three different groups, creating two more labels than we need? Photo by the author. Unlike these labels would imply, these fragments, labeled Tyrannosaurus zhuchengensis, are not simply junior synonyms of Zhuchengtyrannus. The story of T. zhuchengensis is much more complex than that. So, back in 1973, in the original paper that described the famous giant hadrosaur, Shantungosaurus giganteus, Hu Chengzhi, the main author of the paper, also described four of the teeth displayed above, actually assigning them to the North American Tyrannosaurus species, T. rex. In 2001, however, it seems he realized that these teeth were in no way belonging directly to T. rex, and reassigned them to a new species he created inside of the genus Tyrannosaurus, T. zhuchengensis. During this description, he used the same four teeth as before and used a metatarsal, also displayed above. Of course, T. zhuchengensis is most likely no valid genus, and should be regarded as a nomen dubium, since there’s a very small possibility that any of the differences to other tyrannosaurines in the T. zhuchengensis material are diagnostic at a genus level. However, there is a very unique trait of these teeth that’s very clearly seen in the teeth displayed: the serrations in the teeth extend all the way down to the tooth crown. After this display of tyrannosaur material, the NGMC displays another incredibly important, elevated specimen-at first glance. Woah, look, it’s Dave! Woah, look, it’s also a cast! Photo by the author. This display case for the microraptorian NGMC 91(nicknamed “Dave”) is actually quite huge. Much of the space in the case is wasted, due to that huge blank spot at the top. Now, this is also an incredibly important specimen, so obviously, they wouldn’t put it in a permanent display. Even without the signage, it’s quite obvious that this is a cast, since all casts of NGMC 91 have their heads pointing the same way as the counterpart, which seems to never be exhibited in any sort of exhibit. There’s also the fact that the rest of the matrix has been filled in to make a nice little rectangle, when the actual specimen has a matrix in a rather ugly distorted shape. So, basically, in any exhibit: NGMC 91 head facing to your right=cast, and NGMC 91 head facing to your left on a specimen that has an ugly matrix=real. Now, the history of Dave is rather complicated, so I’ll try to be brief. So, in the original 2001 description of this specimen, the authors refrained from assigning the specimen to any genus, as the fact that the slab containing the specimen was split distorted the fossil’s details greatly. However, the next year after, the specimen was assigned as Sinornithosaurus sp. At that time, Stephen Czerkas et al. considered this specimen to actually be a specimen of their new genus, Cryptovalans, now a junior synonym of Microraptor. And so, over the years, NGMC 91 has been jumping from Sinornithosaurus to Microraptor and back and forth. However, the general consensus now is that Dave is a Sinornithosaurus. From this point on, the rest of the display along the side of the gallery focuses completely on the Jehol biota. Part of a crushed Shenzhousaurus. Photo by the author. With this Shenzhousaurus specimen, I don’t have much to say. However, with a specimen displayed like this, there is a huge need for more signage than just the tiny little placard. If you aren’t someone that knows a ton about dinosaur anatomy, then it’s incredibly hard to tell what in the world this thing is. It’s literally just a tail, part of the leg, the hip, part of the torso, and part of the hand. If the signage can’t convey to visitors that what the whole thing looked like, then a huge part of the meaning of the display is lost. A crushed cast specimen of Sinornithosaurus. Here, the NGMC exhibits a cast of a specimen more confidently assigned to the genus Sinornithosaurus. It’s not as great a specimen as “Dave”, but it’s certainly better than that fragment of a specimen exhibited for Shenzhousaurus. And… that’s pretty much all I have to say on this microraptorian. Next, there’s a ton of avialans. Huh, Changchengornis. Haven’t seen that in many museums. Why they named it after the Great Wall, I have no idea. Photo by the author. Here, they actually exhibit the original fossils of the Changchengornis type specimen. It’s weird, considering some much less valuable specimens are represented with casts in the exhibit. That’s a rather nice Confuciusornis specimen right there-oh, wait. It’s a cast. Never get your hopes up with these amazing specimens. Photo by the author. Another Confuciusornis. Photo by the author. Oh, even more Confuciusornis? I sure wasn’t expecting that in a Chinese museum! Photo by the author. And, as the display cases, go on, the exhibit continues to be filled with Confuciusornis. Now, moving on to the center of the gallery, we find some more three-dimensional fossils. This central display case still exhibits an overwhelming amount of Jehol fossils, but a quarter of the display is given to the eggs. Along with other eggs, the NGMC exhibits one of the largest dinosaur eggs of all, Macroelongatoolithus. These eggs aren’t too much of a surprise, since Macroelongatoolithus eggs have been found all over the world. Again, lack of signage is a problem. For people who don’t know what oviraptorid eggs look like, they won’t have any idea what type of dinosaur these eggs belong to, because the only specification that the NGMC offers is that these eggs are called Macroelongatoolithus. In the display, besides Macroelongatoolithus, a number of other oospecies are displayed. Two eggs. Photo by the author. Three eggs. Photo by the author. Twenty-nine eggs. Photo by the author. Those twenty-nine eggs above are why the eggs take up so much of the display space. And, as you can probably assume by now, they all lack any signage that tells visitors what animals those eggs belonged to. Excluding these eggs, the rest of the central display focuses once more on Jehol specimens. Here, they display the originals of some of the most famous Jehol specimens. The type specimen of Caudipteryx. Photo by the author. It’s quite obvious that this display is the original type specimen of Caudipteryx even without looking at the little placard that briefly describes it. The reason why it’s so obvious is because in almost every other Jehol cast specimen in the size range of this Caudipteryx, the matrix is filled in, forming a nice and perfect rectangle. Here, however, the specimen’s matrix is still in its original, rough shape. This specimen was one of the earliest non-avian feathered dinosaurs found, having been described in 1998, just two years after that famous Sinosauropteryx specimen. It’s a very well-preserved specimen, and gastroliths can even be seen in the stomach. However, once again, lack of signage fails to convey the significance of this specimen in paleontological history. Alongside Caudipteryx is another type specimen, of a dinosaur far more obscure, but described in the same paper as Caudipteryx: Protarchaeopteryx. The overshadowed oviraptorosaur: Protarchaeopteryx. Photo by the author. The paper that described the type specimen of Caudipteryx, by Ji et al, also described this specimen of Protarchaeopteryx. Unlike the name would suggest, this is no ancestor of Archaeopteryx. This was an oviraptorosaur, and, generally, it would have looked quite similar to Caudipteryx. Yet it’s fame was far surpassed by Caudipteryx, due to one key factor: this type is the only specimen of Protarchaeopteryx ever found, and it’s much less well-preserved than the numerous specimens of Caudipteryx, including the type. Of course, with the NGMC’s exhibits, these two dinosaurs receive the same amount of focus, due to them both only getting a little placard to go along with their fossils. Along with these two oviraptorosaurs, there’s also a much smaller specimen, which is just made up of some dinosaur tissue and feather imprints from Jehol. And, with that, the dinosaur section of the hall is over. The transition to the Cenozoic begins on the other side of the gallery. The space dedicated to the Cenozoic is rather small, and the displays aren’t ordered in any specific way. A Gigantopithecus jaw. Photo by the author. The largest display in this section is a large display case holding many smaller mammal fossils, among them fossils of bears and rhinos, and casts of the Peking Man, Homo erectus pekinensis. The original mandible of a Gigantopithecus is also displayed, because if you’re a Chinese museum that has a ton of Cenozoic specimens, Gigantopithecus is probably going to be one of them going on display. Next to this large display case, there’s also another, slightly smaller, but longer display case, filled with fossils from horses and proboscideans. Two large Stegodon teeth are among those exhibited here. Photo by the author. This display is peculiar, as almost all of the display seems to focus on teeth, displaying a Homotherium tooth, a Samotherium molar, and two huge Stegodon teeth. Yet, at the right end of the display case, the NGMC places a horse skull. Why this horse skull has any relevance to the focus on teeth the NGMC is going for, I have no idea. With this Cenozoic section, in general, there’s only one mammal specimen that can be called truly stunning. Lagomeryx; the specimen that wants to be unicorn Tsintaosaurus. Photo by the author. This Lagomeryx specimen is incredibly well-preserved, and in some respects, it almost looks like a freshly decomposed carcass. A large canine can be seen in the mouth if you squint, indicating the similarity of Lagomeryx to modern musk deer. Of course, it should have two horns, not just the one crushed horn seen here. Again, there is absolutely no signage explaining anything further than the name, the time, and the locality. The fact that the NGMC actually decided to display such a well-preserved specimen(and one that must be incredibly valuable) is again, surprising, looking at how they’ve used casts for much less valuable specimens. From here, there are only two more displays that are going to be discussed: a rhino and a mammoth. Behold; the great woolly rhinoceros display. Photo by the author. This is one time when the lack of signage here really does damage the display. This is a rhinoceros skull. Most people, looking at it, won’t recognize it as a rhinoceros skull, because it looks nothing like the actual head of a rhinoceros. And, in this case, it’s a woolly rhino, one of the most well-known of the Pleistocene megafauna, but there isn’t even extra text on the sign saying that this is a woolly rhino. Most people know the woolly rhino as the woolly rhino, not Coelodonta antiquitatis. Moving on to another member of Pleistocene megafauna, which is also one of the most famous prehistoric creatures of all time. The great and powerful woolly mammoth, ladies and gentlemen. Photo by the author. If this was also presented with a simple placard, it would also be rather annoying. Of course, not as annoying as the woolly rhino, since people are smart enough to see that this is an elephant tusk, and that the word Mammuthus looks very similar to the word mammoth. But it’s not annoying, cause, for once, the NGMC has more detail on a sign. That’s great, but when did the NGMC decide not to put this kind of sign with slightly more detail on every specimen? And, on that positive remark, we end our little tour of the Prehistoric Biology hall. Overall, it is a decently done hall for a space of this size, and there are some incredibly important and famous specimens on display, but lack of signage is its fatal flaw. Basically, this place is heaven for people with enough knowledge on paleontology, but don’t go there expecting to learn much new stuff. But the biggest point to take away from this: The Geological Museum of China does not have a Shantungosaurus mount anywhere. If you go there for a Shantungosaurus skeleton, you will be disappointed by a single sacrum.